When you are used to cooking for a crowd or even for two, and then you have time on your own, it can become a big chore to cook for yourself. I know I made a lot of excuses on my way home thinking to myself perhaps I could have a bit of salad, or something like a quick omelette. But I knew that I had boneless chicken thighs in the fridge and they really did need to be cooked. So I pulled it all out of the fridge and started slicing. Well, what I didn’t realise was that cooking up this little feast for one was just as quick as making an omelette (or nearly). It was around 25 minutes from getting everything out of the fridge and getting it onto the table and in my tum! • Slice the chicken into thin slices and marinade in the olive oil and piripiri seasoning. • Wash and finely chop the cauliflower (discard the stalks). • Place cauliflower in a pot with a small amount of water, the butter, cream and a grind of salt and pepper. • Cover and simmer cauliflower for 10 to 15 minutes or until very tender. Remove the lid to enable liquid to reduce. • While the cauliflower is simmering, heat the butter in a small frying pan. When hot and bubbly add the chicken and all the marinade. • Cook on medium to high heat turning slices until cooked. Add the lime juice and mix. • Check the cauliflower and mush up with a potato masher. 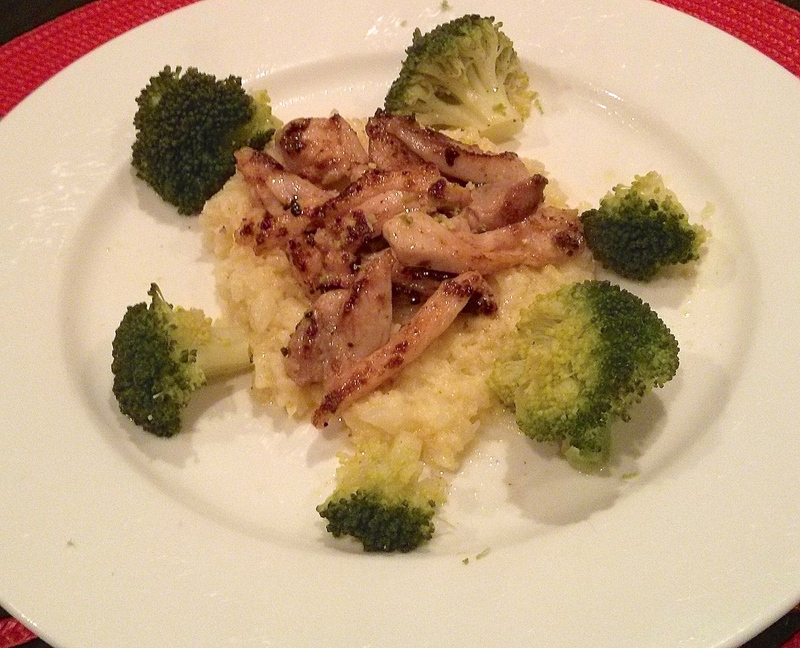 • Serve the chicken over the cauliflower, top with lime zest and your greens. See – that didn’t take long did it? I’ve never seen a creamed cauliflower recipe before- very interesting. Thanks for sharing! Hi K, I hope you try it as it’s so delish!